When running in SolrCloud mode, a "Cloud" option will appear in the Admin UI between Logging and Collections/Core Admin. This screen provides status information about each collection & node in your cluster, as well as access to the low level data being stored in ZooKeeper. 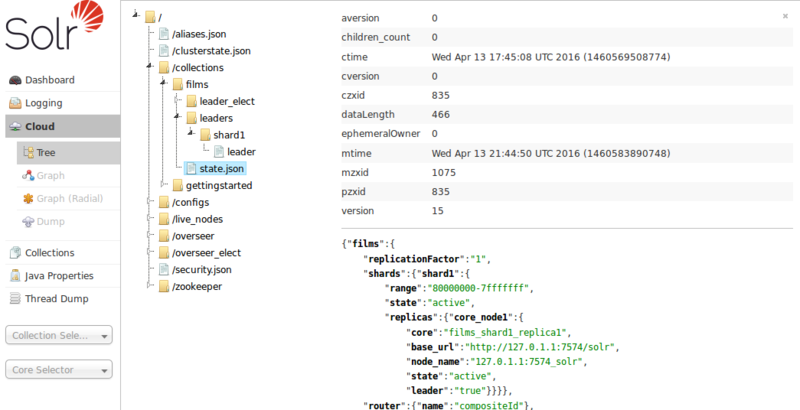 The "Cloud" menu option is only available on Solr instances running in SolrCloud mode. Single node or master/slave replication instances of Solr will not display this option. Click on the Cloud option in the left-hand navigation, and a small sub-menu appears with options called "Tree", "Graph", "Graph (Radial)" and "Dump". 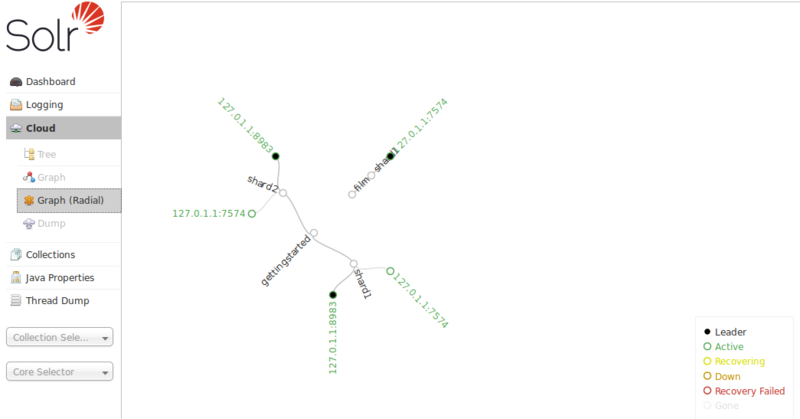 The default view ("Graph") shows a graph of each collection, the shards that make up those collections, and the addresses of each replica for each shard. The final option is "Dump", which returns a JSON document containing all nodes, their contents and their children (recursively). This can be used to export a snapshot of all the data that Solr has kept inside ZooKeeper and can aid in debugging SolrCloud problems.